A member of the rose family, multiflora rose is a dense spreading shrub with wide, arching canes and stiff curved thorns. Older plants may have a root crown diameter of 8 inches or more and can reach a height of 15 feet. Its pinnately compound leaves grow alternately and usually consist of seven to nine small (1/2 to 1 inch) oval leaflets with toothed margins. The leaflets are nearly smooth on the upper surface and paler with short hairs on the underside. 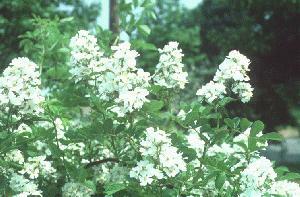 Blossoming in late spring, its numerous white flowers form a panicle from 1/2 to 2 inches across. Native roses usually have pink flowers. The flowers develop into small, hard, nearly round red fruits (called hips) that are 1/4 inch in size. They remain on the plant throughout the winter. The seeds are angular achenes. Introduced from Japan in 1886 as rootstock for cultivated roses, planting of multiflora rose was encouraged by the U.S. Soil Conservation Service beginning in the 1930's to curb soil erosion. The nursery industry also touted the shrub as a "living fence," to control livestock and create snow barriers along highways. It was promoted by wildlife managers as late as the 1960's as an excellent source of food and cover for wildlife. Due to its dense growing habits, it has become a serious problem in the eastern United States and occurs throughout the U.S.
Multiflora rose has naturalized in most of the northeastern and midwestern United States. Presumably, its northern range is limited by an inability to tolerate winter temperatures below -28F degrees. The plant is found in old fields, pastures, roadsides and forests. It can live in a wide range of soil and environmental conditions, but thrives in sunny areas with well-drained soils. It is not found in standing water or extremely dry habitats. Multiflora rose blooms in May or June. Individual plants may produce up to 500,000 seeds per year. The majority of seedlings emerge near the parent plant from which the seeds fell. In addition, many species of birds and mammals feed on the hips, dispersing the seeds widely. The canes are also capable of rooting when in contact with soil. In areas where multiflora rose is just beginning to invade, fire can limit its establishment. Scattered populations in high-quality areas can be effectively controlled by complete removal of the plants. All roots must be removed because new plants can grow from severed roots. Mowing with heavy equipment has proven effective, although non-selective. However, the strong thorns have been known to puncture rubber tires--filling tires with foam may help. Mowing or cutting should be repeated 3-6 times during the growing season for at least 2-4 years. Follow-up monitoring is necessary because new plants may arise from root fragments or previously dormant seeds. Manual application of herbicides on freshly cut stems has proven an effective means of control as it can destroy the root system and prevent re-sprouting. After the stem is cut, herbicide should be applied. Glyphosate can be used effectively as a 10-20 % active ingredient (a.i.) solution if applied to the cut stems or canes in the growing season (between July and September) or during dormancy. Application during dormancy is preferable because it reduces the likelihood of damaging other species. A foliar spray of 1% a.i. glyphosate solution applied to flowering or budding plants is also effective, especially when the flowers are in full bloom. However, it is non-selective and should not be used in high-quality natural areas. A foliar spray of 2% a.i. fosamine solution in water can be effectively used from July to September if the foliage is well covered. Do not spray so heavily that herbicide drips off the target species. Die-back will not be apparent until the following summer. Fosamine is the preferred folier spray treatment because it is non-volatile and will only affect woody species. A 1% a.i. solution of dicamba can be applied as a foliar spray. Dicambe is selective against broadleaf and should never be used if desirable broadleaf vegetation is present. Application is most effective when administered during May or June when plants have achieved full leaf-out and are actively flowering. When treating dense foliage, one-half ounce of surfactant should be added per gallon of water for maximum effectiveness. A handful of water softener salt placed at the base of the plant has apparently proven effective, but will remain in the soil for many years. Biological methods exist to kill or damage multiflora rose. Rose rosette disease, a native virus vectored by a eriophyid mite (Phyllocoptes frutiphilus), can be fatal. However, it may infect native roses and plums as well as commercially important members of the rose family like apples, some berries, and ornamental roses. The disease spreads from infected canes to the roots and then to other canes. Plants usually die within 1-2 years. Pruning may be practical in areas where the disease is present because it encourages succulent growth, increasing plant susceptibility to mite infestation.